Anyway, they’ve had a bit of a revamp and you’ll see in their store how great it all looks. I was very kindly set some goodies and these soy wax melts immediately caught my eye, probably because one of them had marshmallow in – yum! It certainly is and it’s not majorly overpowering, this can happen with a lot of the darker fruit scents but in saying that, it really does pack a punch! It just doesn’t give you that heady fruit smell that you can get when you’re making jam. I now really want to make jam. Obviously as a vanilla lover this was always going to be a winner! It’s much sweeter and it would be a great mixology scent too. I was quite nervous about this one as I got by the description how important this scent was to the brand but I can find minty scents to be very strong and a overpowering for me. But this one is SUPERB so my fear was wrong – yay! It’s much more of a delicate scent and it totally reminded me of holidays. I’ve been to Brighton many times and this is such a lovely scent and great for memories. I love marshmallow and it’s great when the mix is great as it really brings out the sweetness. Obviously vanilla is good for this (I did near the end of using this melt put in some of the vanilla sugar and it was amazing!) but coconut really brings it out. I loved how much I loved this scent and how great it would be all year round. Would love to mix it with some pineapple through the summer. The range of scents is unbelievably good, there really is something for everyone. The melts are 25g and come in cute little pots that I have washed out and reused for decanting skincare samples into. Each melt is just £1.25 which is a bargain price too and I got about 14 hours from each one before the scent really started to fade. You can see the soy wax melts collection HERE. Victoria creates small batch, hand-poured artisan candles in her kitchen at home in Brighton, East Sussex, UK. All the candles that you purchase have been HANDMADE by Victoria, and always will be. 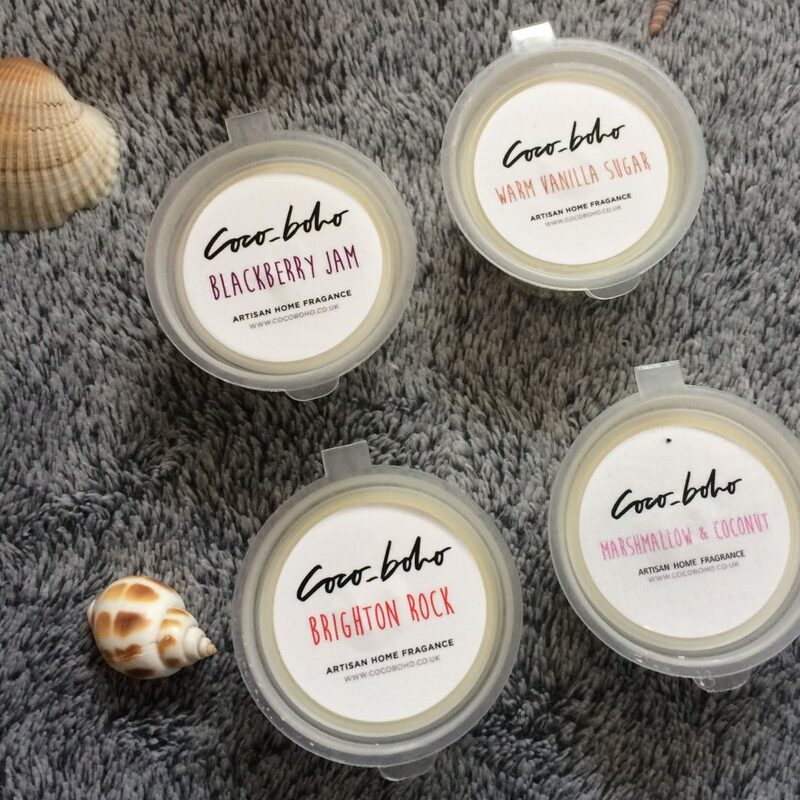 Coco_boho use either 100% pure soy, or a soy and vegetable wax mix in all the candles and only add high quality fragrance oil. They also choose the right sized cotton wick to fit the container. To check out the rest of the shop have a look HERE – there’s candles and more! You can find out more about Coco_Boho on Facebook, Twitter and Instagram. *As always, no payment was made for this review. We don’t do that. This was my honest review. Coco_boho Candles are awesome!